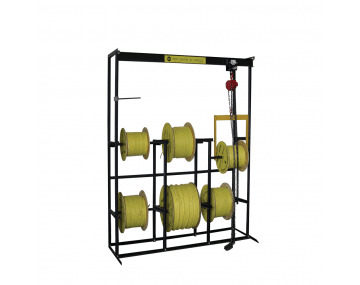 The Large Cord & Cable Reel Rack with Hoist holds six full reels with 1,000 lb capacity, totaling 6,000 lbs. This rack can support reel sizes 30-inch diameter by 20-inch width. The large reel rack is constructed with heavy-duty steel, is easy to load or dispense by just one person, and keeps areas organized. HOLDS SIX FULL REELS OF TPC CORD AND CABLE — Full reels reduce waste— only one end piece. Reduces the improper storage of unusable lengths. EASY TO DISPENSE THE CABLE NEEDED — Allows you to take just the right amount of “Kink Free — Twist Free” TPC product for the job at hand, therefore reducing waste. HALF TON HOIST WITH TROLLEY — Makes reel handling easy. Designed to be loaded or dispensed by just one person. HEAVY STEEL WELDED CONSTRUCTION — Built to last. TAKES UP VERY LITTLE SPACE — Can be located in stores, crib, construction or high maintenance areas. Organizes inventory and makes visual inspection easy.